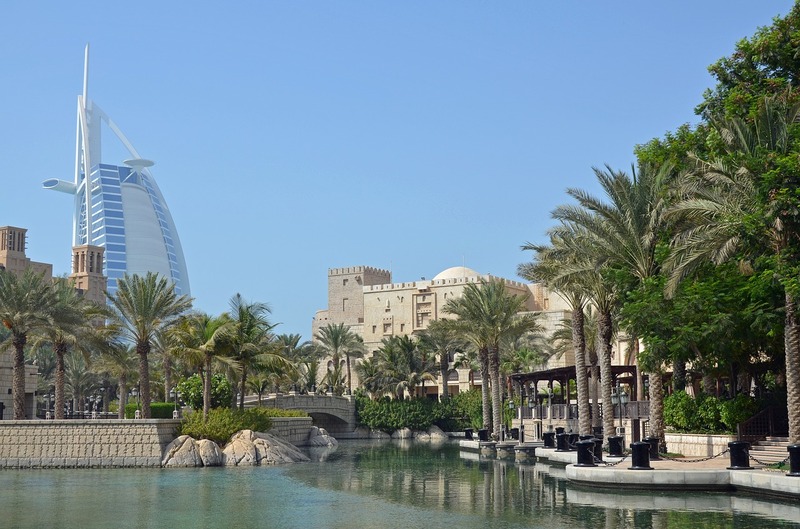 These Dubai locations could achieve peak real estate prices in the short term. 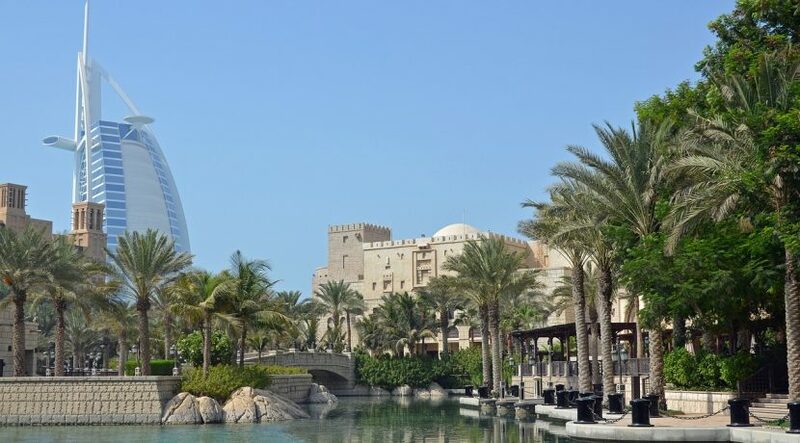 Dubai’s real estate cycle, which peaked in mid-2014, went through a correction phase throughout the following years, with citywide capital values losing 15.3 per cent on a weighted average basis since peak. But once we breakdown the Dubai cycle into submarket micro cycles, we discover more interesting patterns. Submarkets are usually defined by location, but in the ValuStrat Price Index’s (VPI) case, is further classified based on hedonic attributes, which basically means that the VPI monitors asset capital movements based on quality, views, age, facilities, amenities, etc. By analysing submarkets that peaked nearly four years ago, we find several locations appear to have bottomed out or are possibly very close to doing so. Jumeirah Lakes Towers (JLT), Jumeirah Beach Residence and the most transacted area, Dubai Marina, are good examples of well-located communities that continue to see price drops, albeit at decelerating rates of decline. Present-day buyers can try mitigating against further price deterioration by negotiating a discount from the seller; this is already happening as evidenced when comparing asking prices with actual transacted prices. 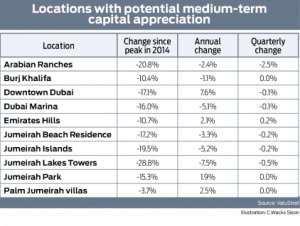 Investors may feel these locations have the potential of medium-term capital appreciation and possible recovery of some of the declines seen since the last market peak price falls of 28.8 per cent in JLT, 19.6 per cent in Jumeirah Islands, 15.2 per cent in Jumeirah Park and 20.9 per cent in Arabian Ranches since 2014. Case in point, Palm Jumeirah villa prices are currently 4.2 per cent below the 2014 peak, but four-bedroom Garden Homes, particularly those located closer to Frond ends and enjoying better sea views, have already exceeded their previous peaks. On average, peak prices in August 2014 amounted to Dh18.3 million, while as of December 2017 those same villas averaged Dh19.1 million in value. Given the overwhelming off-plan activity in Downtown Dubai, which put pressure on ready property sales volume, capital values for ready properties there gained 7.6 per cent since January last year. This is driven by the desirability for relatively older but strategically located Emaar buildings, particularly with high construction activity surrounding it, as savvy investors are aware that these projects will be handed over in two to three years at most, leaving the area with less land for developers to build on and potentially raising capital values towards their previous peaks in the medium term. If we exclude Armani hotel apartments, Burj Khalifa apartment capital values seemed to have stabilised since last year registering a 10.3 per cent average decline from peak; prices today are now equal to what they were in January 2014. Even within the city’s most prime locations, how much investors gain in capital appreciation very much depends on timing; it makes sense to enter the market at its trough stage, and in some cases when there are early signs of capital appreciation. But it also makes sense to have a clear understanding of the master development and what is under construction as these buildings will soon be completed, affecting nearby properties positively. It’s natural that at this current stage of the cycle, the most desirable properties go first — the ones with better views, layouts, quality and location. It must be said that while some investors feel that such peak prices may be obtainable in the medium term, future growth can’t be guaranteed. Dubai’s market performance is not only driven by demand and supply dynamics, but also on economic forces that very much directs the sentiment of investors.